The PF35 is the smallest feeder from the standard series. This dosing device has a capacity of approx. 0.1-1 l/min which is perfectly in line with the necessary capacities for a typical HR350 or PC-S process. All PF machines are equipped with a mixing arm for prevention of separation and bridging. This ensures that the different components cannot DE-mix during the pelleting and/or coatings process. For complete automatic systems there are loss in weight and/or pre-weigh systems available. 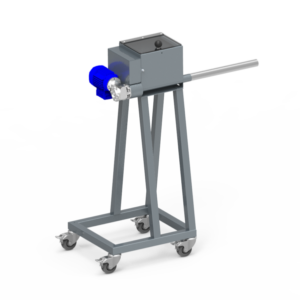 ◦ Standard mounted on 4 swivel wheels for optimum mobility and flexible access to coating device. Fill in the form below and a link to the PDF-file will be shown.